The front porch at Linderhof is and always has been screened. The house faces east and so the porch on warm spring and summer afternoons is cool and shady and if there is any breeze, it does waft through making the porch a haven in the afternoon. 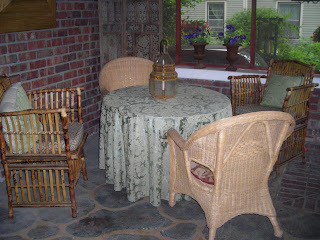 When my chores for the day are done, in spring and summer, I head with my glass of icy tea for the front porch -- to sit in one of the chairs and sip my tea. 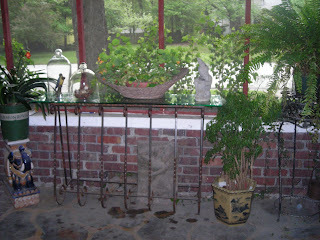 It is the place, too, that some of the houseplants spend their summer -- a piece of old iron topped with glass (which always needs to be washed it seems) holds this summer a big nasturtium plant as well as a garden statue that is 34 years old. It is a gnome reading and was originally bought to go in the center of our first birdbath. That birdbath is long gone but the gnome has moved with us all these years. He now has that lovely concrete patina that only time can do. 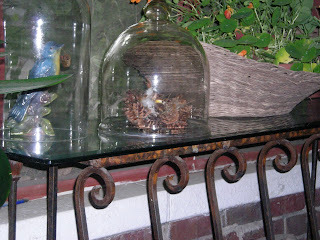 The other end of the table hold two iron cloches -- under one a bird nest (a Christmas gift from dear friends) and under the other an old bird for we treasure birds at Linderhof. Ferns fill in spaces for we love ferns and their graceful fronds. The porch WAS the place we started our day in spring, summer, and fall until we built the "room with a view" -- the breakfast room. But I can't neglect the porch -- my morning and afternoon haven for so many years and so spring and summer afternoons still find me here with my glass of icy tea.